Stirling Moss trade cards produced in 1955 following the Mille Miglia. Homepage. This page: A collection of Stirling Moss trade cards pub. by the News Chronicle following the 1955 Mille Miglia. 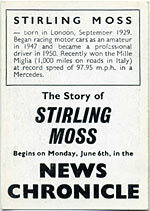 The ten children's trading cards described on this page, were issued by the News Chronicle newspaper, starting on Monday June 6th, following just a month or so on from (Sir) Stirling Moss' epic drive, with Denis Jenkinson, in the Mille Miglia road race, behind the wheel of a Mercedes-Benz 300SLR. How many were originally published in this set of cards isn't mentioned anywhere, so perhaps there are more out there than the ten I bought a few years ago at, I think, a toy fair. Moss was, and is, renowned for the sheer variety of different cars he raced from the late 1940s, through the 1950s and into the 1960s, until his horrific accident at Goodwood which ended his full-time racing career. Single seaters, sportscars, and road cars were all actively campaigned throughout his racing career, at hillclimbs, sprints, circuit meetings and rallies. Despite never winning the Formula One World Championship, his other on-track successes, coupled with his activities away from the circuit, ensured his legendary status for all time in the eyes of most motorsport fans. Stirling Moss - born in London, September 1929. Began racing motor cars as an amateur in 1947 and became a professional driver in 1950*. Recently won the Mille Miglia (1,000 miles on roads in Italy) at record speed of 97.95mph in a Mercedes. The cards aren't numbered, so I've grouped them up into pairs. The first pair are photos of the man himself, looking fresh faced in the early years of his professional motor racing life. The second photo shows SCM (Stirling Craufurd Moss) holding the Richard Seaman Trophy aloft, in 1950. Fifty years later he would receive his knighthood. Now, at speed in two different 500cc racing cars. The first is Moss competing at the Prescott Hillclimb (negotiating the Pardon Hairpin it would appear) behind the wheel of a 500cc Cooper in 1948. The second is a circuit meeting, with Moss piloting car number 28, his 1952 Kieft. A photo of Moss on the cover of the 500cc racing magazine Iota in 1952, can be seen on this page of the site. Two years on from the Kieft photo, and Moss is seen in his Maserati 250F at Aintree in 1954, running his "lucky" number 7. Patriotically, he re-painted his Italian racing car in green, rather than continuing to race the Maser in its native red. Another shot of Stirling sat in his Maserati, at Silverstone this time in 1955, a busy year for the racing driver as the photo alongside it shows. Here he is behind the wheel of the works' Mercedes-Benz 300SLR, entry number 722 for the 1955 Mille Miglia (07.22 being the pair's start time). Note the mildly re-profiled front corner of the bodywork after a minor bump. Despite this, Moss and Jenks would win the road race, averaging nearly 100 mph on public (open) roads. The last of my cards in this set again show Moss in a Mercedes-Benz, this time the single-seater Grand Prix W196. The first picture shows Moss in the Mercedes, parked in a paddock, while he chats with Mercedes-Benz racing team manager Alfred Neubauer. Note the VW split-screen van parked alongside, belonging to Continental, the tyre manufacturer. A second shot has Moss at speed in the W196. Did the W196 ever run with a grille like this, or has the airbrusher been at work? A German tin-plate toy version of the W196 can be seen here, in the toy car section of the site. Return to the motor-related trade cards section at oldclassiccar. References to Moss appear in many different locations across the site (the site search should find them). For example, a photo of an Austin-Healey with Moss perched on the rear, quite probably prior to an Aintree race, features on this page of the photos section.